Mike Greene - mgreene@shawmedia.com Four month old Amelia Haggard, of Crystal Lake, plays with a popsicle while being held by her mother Andrea during the Annual Independence Day Parade Sunday, July 1, 2012 in Crystal Lake. 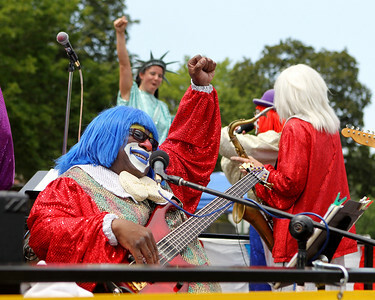 Over 100 different groups participated in the parade from City Hall to the Lakeside Festival. Mike Greene - mgreene@shawmedia.com Members of the crowd take part in a stunt with Wacky Wheelers/Jolly Giants during the Annual Independence Day Parade Sunday, July 1, 2012 in Crystal Lake. 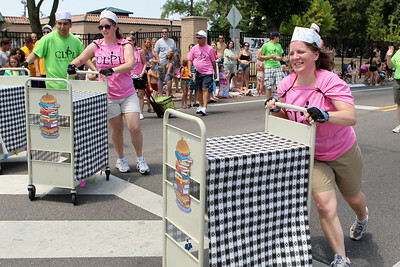 Over 100 different groups participated in the parade from City Hall to the Lakeside Festival. 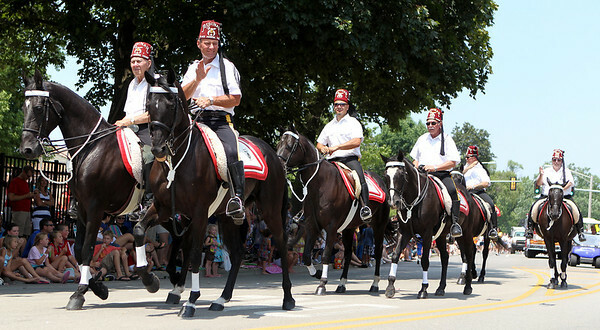 Mike Greene - mgreene@shawmedia.com Members of the Medinah Black Horse Troop wave to the crowd during the Annual Independence Day Parade Sunday, July 1, 2012 in Crystal Lake. 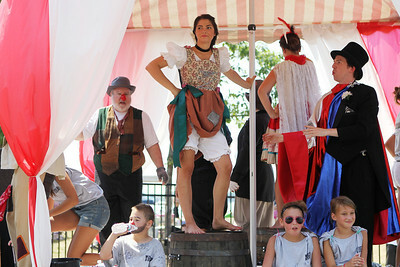 Over 100 different groups participated in the parade from City Hall to the Lakeside Festival. 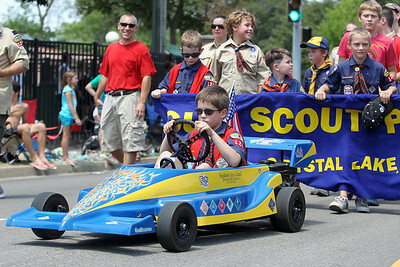 Mike Greene - mgreene@shawmedia.com Jacob Mortz leads Cub Scout Pack 127 of Crystal Lake during the Annual Independence Day Parade Sunday, July 1, 2012 in Crystal Lake. Over 100 different groups participated in the parade from City Hall to the Lakeside Festival. Mike Greene - mgreene@shawmedia.com Members of the Crystal Lake Central Poms team perform during the Annual Independence Day Parade Sunday, July 1, 2012 in Crystal Lake. Over 100 different groups participated in the parade from City Hall to the Lakeside Festival. 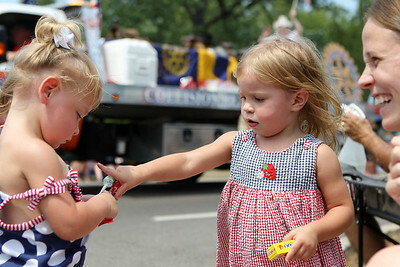 Mike Greene - mgreene@shawmedia.com Haley Schlegel (right), 2 of Pennsylvania, shares candy with Leiah Hjerpe, 2 of Crystal Lake, during the Annual Independence Day Parade Sunday, July 1, 2012 in Crystal Lake. Over 100 different groups participated in the parade from City Hall to the Lakeside Festival. Mike Greene - mgreene@shawmedia.com Aaron Holbrook, of Huntley, and the Lawn Chair Dads perform during the Annual Independence Day Parade Sunday, July 1, 2012 in Crystal Lake. 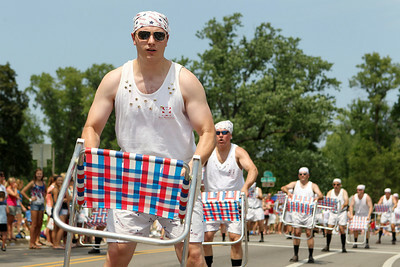 Over 100 different groups participated in the parade from City Hall to the Lakeside Festival. 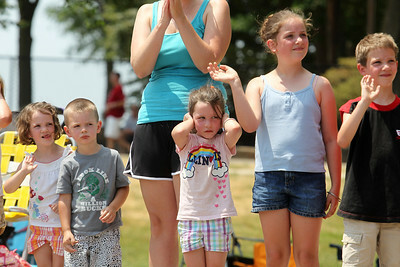 Mike Greene - mgreene@shawmedia.com A members of Chuck-A-Roo cheers during the Annual Independence Day Parade Sunday, July 1, 2012 in Crystal Lake. Over 100 different groups participated in the parade from City Hall to the Lakeside Festival. 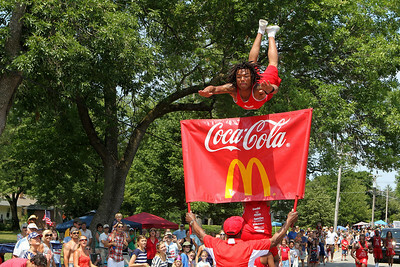 Mike Greene - mgreene@shawmedia.com A member of the Jesse White Tumblers high-fives a teammate while flying through the air during the Annual Independence Day Parade Sunday, July 1, 2012 in Crystal Lake. Over 100 different groups participated in the parade from City Hall to the Lakeside Festival. Mike Greene - mgreene@shawmedia.com The crowd reacts as the Jesse White Tumblers perform during the Annual Independence Day Parade Sunday, July 1, 2012 in Crystal Lake. Over 100 different groups participated in the parade from City Hall to the Lakeside Festival. 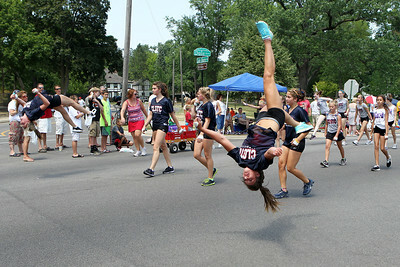 Mike Greene - mgreene@shawmedia.com A member of the Jesse White Tumblers performs as the crowd watches on during the Annual Independence Day Parade Sunday, July 1, 2012 in Crystal Lake. Over 100 different groups participated in the parade from City Hall to the Lakeside Festival. Mike Greene - mgreene@shawmedia.com Riley Freese, 13 of Crystal Lake, waits for customers while selling popsicles during the Annual Independence Day Parade Sunday, July 1, 2012 in Crystal Lake. Over 100 different groups participated in the parade from City Hall to the Lakeside Festival. Mike Greene - mgreene@shawmedia.com Cast members of The Fantasticks and supporters of the Raue Center relax on their float during the Annual Independence Day Parade Sunday, July 1, 2012 in Crystal Lake. Over 100 different groups participated in the parade from City Hall to the Lakeside Festival. Mike Greene - mgreene@shawmedia.com Carrie Sosnowski, 5 of Crystal Lake, claps for the color guard presentation during the Annual Independence Day Parade Sunday, July 1, 2012 in Crystal Lake. Over 100 different groups participated in the parade from City Hall to the Lakeside Festival. 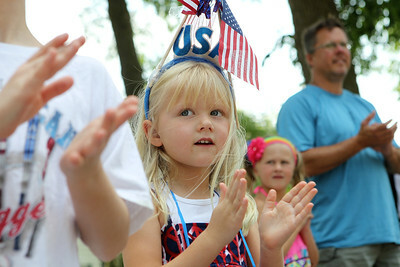 Mike Greene - mgreene@shawmedia.com Rosaline Harhen, 5 of Marengo, covers her ears as fire engine drive by with their sirens while watching the parade with siblings and cousins during the Annual Independence Day Parade Sunday, July 1, 2012 in Crystal Lake. Over 100 different groups participated in the parade from City Hall to the Lakeside Festival. 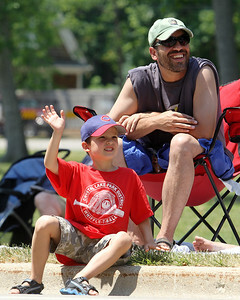 Mike Greene - mgreene@shawmedia.com Miles Davidson, 5 of Crystal Lake, waves at parade participants as his dad Sam watches on during the Annual Independence Day Parade Sunday, July 1, 2012 in Crystal Lake. Over 100 different groups participated in the parade from City Hall to the Lakeside Festival. 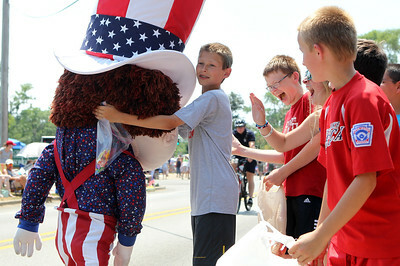 Mike Greene - mgreene@shawmedia.com Kevin Winslow, 13 of Lakewood, hugs a member of Funny Little People during the Annual Independence Day Parade Sunday, July 1, 2012 in Crystal Lake. Over 100 different groups participated in the parade from City Hall to the Lakeside Festival. Mike Greene - mgreene@shawmedia.com Mari Swift of the Crystal Lake Public Library performs a maneuver during the Annual Independence Day Parade Sunday, July 1, 2012 in Crystal Lake. Over 100 different groups participated in the parade from City Hall to the Lakeside Festival. Mike Greene - mgreene@shawmedia.com Members of Crystal Lake Gymnastics Training Center perform during the Annual Independence Day Parade Sunday, July 1, 2012 in Crystal Lake. Over 100 different groups participated in the parade from City Hall to the Lakeside Festival. 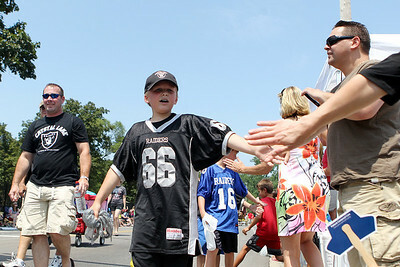 Mike Greene - mgreene@shawmedia.com Crystal Lake Raiders member Alex Millar, 9 of Crystal Lake, gives high-fives to the crowd during the Annual Independence Day Parade Sunday, July 1, 2012 in Crystal Lake. Over 100 different groups participated in the parade from City Hall to the Lakeside Festival. 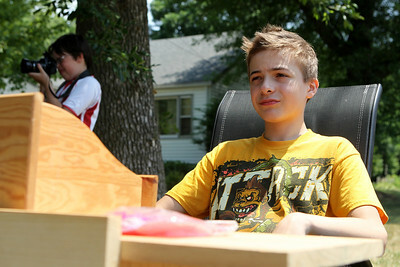 Riley Freese, 13 of Crystal Lake, waits for customers while selling popsicles during the Annual Independence Day Parade Sunday, July 1, 2012 in Crystal Lake. Over 100 different groups participated in the parade from City Hall to the Lakeside Festival.